One of my “goals” this New Year was to be more thankful. My goal is to find something every day to say “thanks God… I know that was you!” As I was blog stalking, uhm, I mean, as I was visiting some of my favorite blogs, I came across this one and got a GREAT idea! 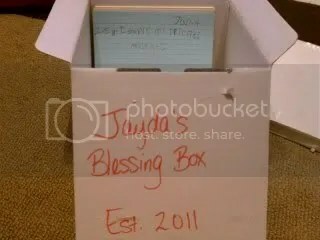 Create a blessing box! I thought this was a fun and creative way to hold me accountable and best of all, Jayda can do it too! 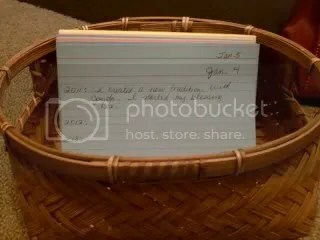 Jayda was so excited and so was I… we just labeled the top of the card with the date and then we put the year on the left side and wrote our blessing for the day. We then “filed” today’s cards to the back and will repeat tomorrow. Great tradition!! Ours isn’t as “decorative” as the one where we got the idea… but, a blessing is a blessing! Made to Crave: Satisfying Your Deepest Desire with God, Not Food by Lisa TerKeurst It is opening my eyes to some bad habits and what I need to do to “fix” them… which in turn is leading me into some very serious talks with our Lord! So Long, Insecurity by Beth Moore it is an awesome read so far! 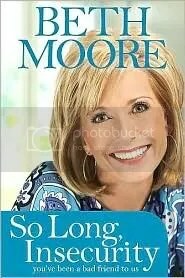 I just LOVE Beth Moore! So, 2011 is going good so far! I’m sure it won’t be perfect… but hey… perfect is a bit boring don’t ya think? >I saw this book on the nook site and im so going to get it now! Thanks for always being so inspiring myra! 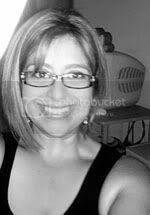 on January 6, 2011 at 2:49 pm | Reply Cindy S.